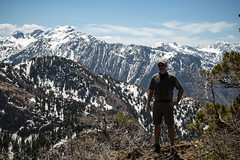 The weather where I live in Utah is finally very warm, and the snow meting enough that I could make the first big hike/climb of the year just yesterday. 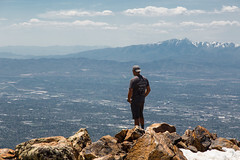 I joined a meetup.com group “Ultimate Thrillseekers” to summit Mount Olympus which is one of the prominent peaks you see in the backdrop of Salt Lake City. It is not Mount Everest and actually 20,000 feet lower in elevation, but at just over 9000 feet it is no small hill either to break in the legs this year. 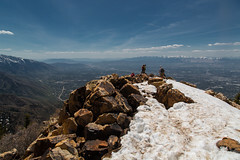 The hike is about 3.5 miles each direction and about 4500 feet elevation gain with a mix of dirt, mud, snow, scree, and a good rock scramble in the final stretch to the snow capped summit. The only mistake I may have made was racing a group of young US Marines down the mountain, and for that my legs hurt today. I am in the San Francisco office today and tomorrow, and honestly having a hard time hiding the discomfort of my legs from the first good hike/climb of the year. But all the discomfort in my legs from the good workout was well worth it. I look forward to many more this Summer. I am still down 40 pounds from a year ago and plan to keep active, and not waste a single minute. It was an amazing day, view of the city, and new friends. 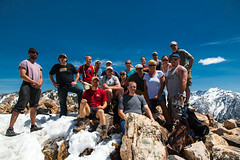 I can’t stress enough how awesome meetup.com is and how many groups I have been active in like photography, social groups, and several outdoors meetup groups. It is amazing how many new friends you can meet and the activities you can do on the free website. Live, play, and work hard. Get off the computer and go enjoy the outdoors, live life to the fullest, you won't regret it.